Ref Watch: Was Jurgen Klopp right to be annoyed by Burnley tackles? Should Manchester United defender Marcos Rojo have seen red against Arsenal? Were the Gunners unfortunate to have two late goals disallowed? 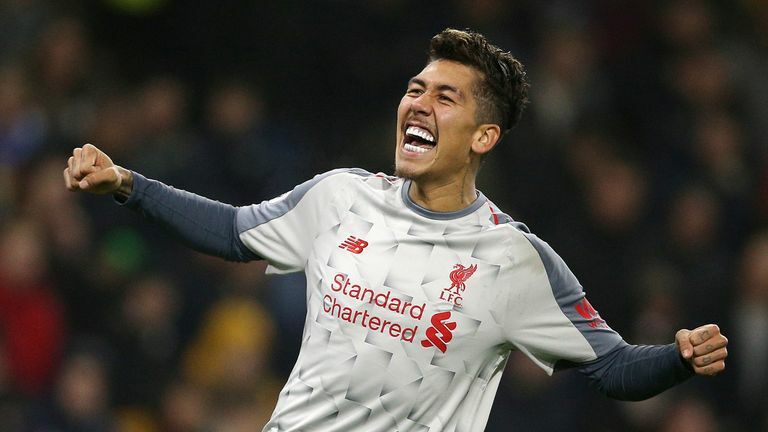 And was Jurgen Klopp right to call for more protection for players after Liverpool's win at Burnley? Former Premier League referee Dermot Gallagher reviewed all the big midweek decisions on Ref Watch on Sky Sports News. INCIDENT: Liverpool's Joe Gomez is injured after a sliding tackle from Ben Mee. Phil Bardsley then escapes punishment for a challenge on Alberto Moreno. VERDICT: No foul by Mee, yellow for Bardsley. DERMOT SAYS: I thought it was a really good, hard, fair tackle by Mee. Gomez's own momentum takes him off the pitch and sees him slide into the advertising boards, that's where the damage is done, not by Mee's tackle. Bardsley's tackle is a foul and a yellow card, but certainly not a red. He goes with one foot, he does go over the top but he catches him with the side of the foot, not with the studs. A yellow would be appropriate, not a red. Was Jurgen Klopp right to be frustrated with Burnley's tackling? INCIDENT: Chris Wood appears to be offside when Jack Cork scores Burnley's opener and the ball is also kicked out of the hands of Liverpool goalkeeper Alisson. DERMOT SAYS: I think Wood is just offside when James Tarkowski heads the ball down. Once Alisson has his hands on the ball on the ground he is deemed in possession and the forward can't go for it. INCIDENT: Anthony Martial scores to make it 1-1, but Ander Herrera appears to be offside in the build-up. DERMOT SAYS: It's just offside, but it's very tight. Was Ander Herrera offside when the free-kick was taken that led to Anthony Martial's goal? INCIDENT: Marcos Rojo only gets a yellow card for a sliding tackle on Arsenal's Matteo Guendouzi. DERMOT SAYS: He has gone with one foot and he is low. He catches him with his trailing leg and I think a yellow is fine. Should Marcos Rojo have seen red? INCIDENT: Arsenal have two late goals ruled out, the first because Alexandre Lacazette heads the ball out of David de Gea's hands and the second because Henrikh Mkhitaryan is offside. DERMOT SAYS: De Gea has control of the ball because it's in his hands. It's a good spot by the assistant for the second one because he has to be alert to the fact that Mkhitaryan is offside. 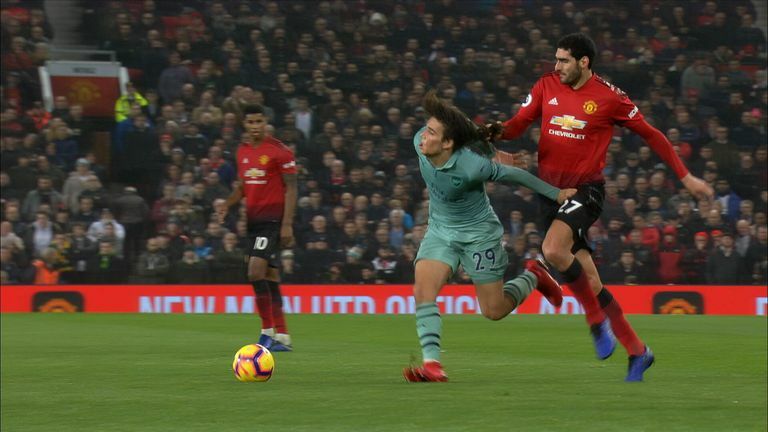 INCIDENT: Marouane Fellaini is booked for pulling Guendouzi's hair. DERMOT SAYS: I think the referee gives a foul and can't see the hair pull, because if he does then it has to be a red card for violent conduct. Robert Huth was banned for three matches for pulling Fellaini's hair in 2016, so the FA obviously see it as violent conduct. NB - The FA have said there will be no retrospective action against Fellaini as the referee gave a free-kick so that is deemed to be appropriate action. 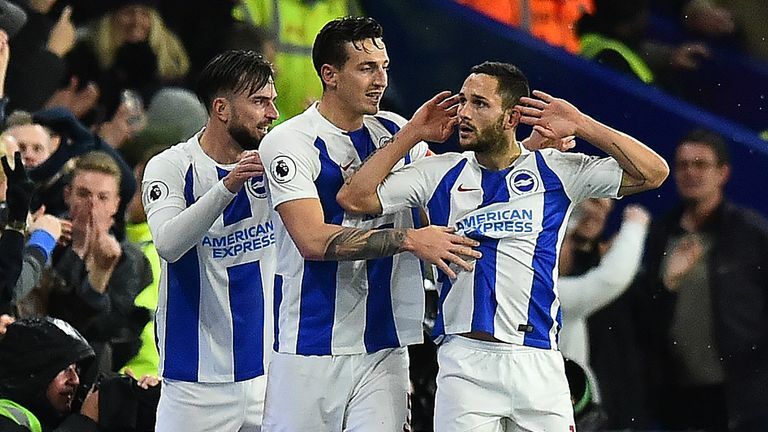 INCIDENT: Brighton win a penalty for a foul by James McArthur on Jose Izquierdo. Referee Kevin Friend then doesn't give a penalty for a challenge by James Tomkins on Glenn Murray. VERDICT: One wrong, one right. DERMOT SAYS: I think Kevin misreads the first one, he thinks Izquierdo gets the touch on the ball but it is the defender who gets it. For the challenge on Murray there is minimal contact. INCIDENT: Crystal Palace are awarded a penalty for a foul by Leon Balogun on Wilfried Zaha. DERMOT SAYS: Zaha has moved the ball out of Balogun's reach. He catches him and it's a penalty. INCIDENT: Chelsea don't get a penalty as Willy Boly slides and catches Alvaro Morata in the box. DERMOT SAYS: I think he gets in front of him and gets the ball and Morata's momentum takes him over. For me it's 100 per cent not a penalty. INCIDENT: Salomon Rondon opens the scoring for Newcastle, but was there a foul in the build-up to the move? DERMOT SAYS: Just play on. There's so much still to do. People might say would VAR rule this out, but VAR would never go back this far, there was too much to do. 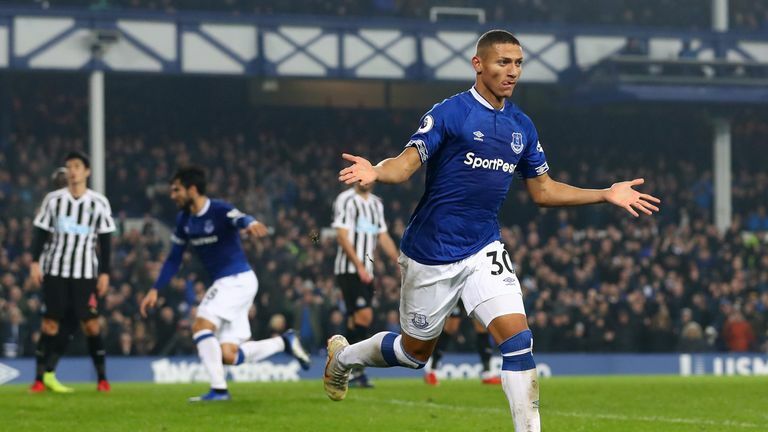 Was there a foul in the build-up to Newcastle's opener in their draw with Everton? INCIDENT: Charlie Austin looks to be offside when he scores Southampton's late consolation goal. DERMOT SAYS: I think it's a really good call. He looks offside but you see it from the sideways angle and he's just on. INCIDENT: Was Callum Wilson onside for his opening goal? DERMOT SAYS: I think you have to give the assistant credit. 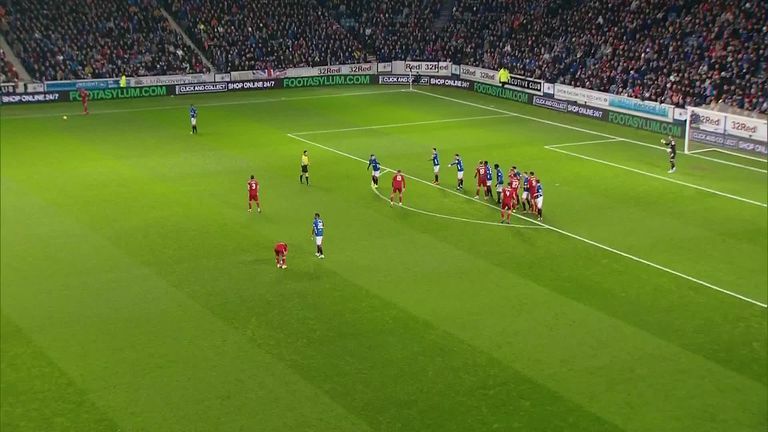 There are so many players going for the ball from the free-kick and it's a really good call. 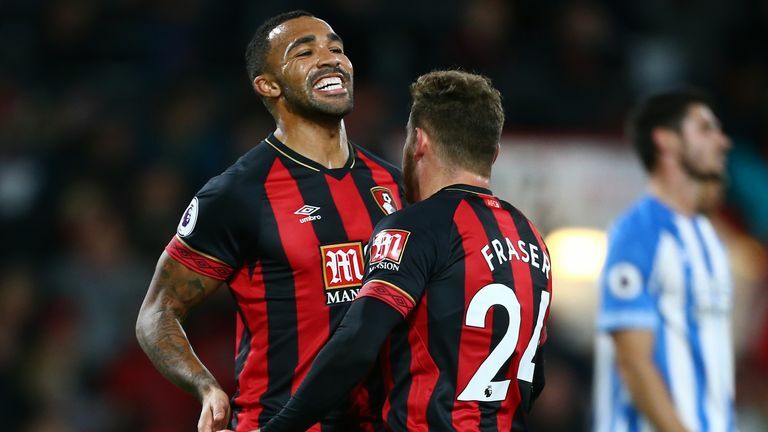 Bournemouth beat Huddersfield, but should their first goal have stood? INCIDENT: Huddersfield appeal for a penalty in the 89th minute when the ball strikes Nathan Ake's arm, but the referee does not point to the spot. DERMOT SAYS: I am not convinced it hits his arm, and if it does then it hits his thigh first, so he has no idea. INCIDENT: Aberdeen's Sam Cosgrove and Rangers' Alfredo Morelos are both sent off for second bookings. DERMOT SAYS: With Cosgrove there's no need to make that tackle, it's a reckless tackle and he gives the referee no choice. Even Steven Gerrard said about Morelos afterwards that why would you do it - you're on a yellow already and it's on halfway.